No matter what you do, something is going to be wrong with your Hamentaschen. Hamentaschen baking and garden planning are always linked in my mind. Even Henry just asked "Is it spring yet?". Seed Catalogues were my sole companion during last week's Involuntary Arctic Exile, and I stayed busy convincing myself not to plant any number of exotic heirloom varieties. 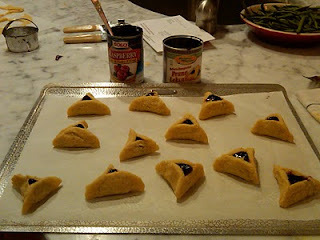 And Amanda and I sent links for Hamentaschen Recipes back and forth in gchat. Hamentaschen are like Connecticut vegetable gardens. In the garden, either its too hot, too cold, too wet, too dry. Spring is too early, or too late. Its either blossom-end rot, or tomato horn worms. And if its none of those, deer or woodchucks get in. And there are rabbits. 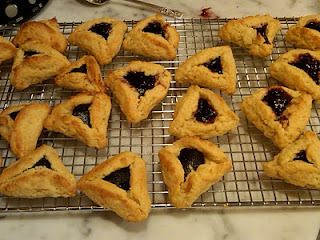 Hamentaschen are either tasteless and dry, or tasty and deformed. If you make poppy, people complain that they are not apricot. If you make apricot, you wish you had raspberry. And although you never really had a scrumptious triangular cookie with a Yiddish name and a fruity filling, you always secretly believe that, like a hardy but tasty tomato seed, eventually all will be revealed. Why do we persist? Seed catalogs and baking hamentaschen are signs that spring is on the way. And Jews and gardeners are nothing if not persistent. Amanda went with tasty dairy hamentaschen made with a rugelach- like cream cheese and butter pastry. Alas, they did the come-unstuck-flop-open-into-circles- with-blobs-of-jam thing. I decided to revisit and tweak a recipe that I thought had potential, one that boldly claimed to be "The Best Hamentashen You Will Ever Eat"
Although I wouldn't go that far, they really don't taste too bad. (Jews and gardeners...hopeful).The problem with these is that they are seriously UGLY. Part of the problem is mine-- in my last frenzied stock up at Whole Foods, I bought Organic Cane Sugar- which is significantly coarser than my usual Domino. And thinking that more is more in the taste department of non-buttery baked goods, instead of using my microplane grater, I grated the orange peel coarsely. So the dough was lumpy, ergo lumpy result. The combo of the coarse sugar and the coarse orange peel, however made for a crisp and flavorful cookie, one that even improved a bit with time. Sift flour, sugar, baking powder, orange zest, and salt into the bowl of a stand mixer. Add shortening or butter in tablespoon-sized pieces and combine with the paddle attachment until the dough has big crumbs. Combine orange juice, extract, and beaten egg. Add these wet ingredients to the dough and mix until a dough is formed. I found the dough very dry and added an extra Tablespoon more juice or soy milk. Divide into two mounds, and roll each out between 2 sheets of parchment to a thickness of about 1/8 inch. Chill well-- at least an hour. For more about this see the sugar cookie entry. Remove a chilled dough sheet from the fridge. Remove top parchment and flip over onto baking sheet. Using a 3” round cutter, (or a glass like your "Oma" did), cut dough sheet into circles. Place 1 (scant) teaspoon of filling in the center of each circle. Fold up the corners and seal well forming triangles. Place cookies on cookie sheets and bake 12 – 15 minutes, rotating if your oven requires it until light golden brown. Let cool on sheets about 2 minutes then transfer to a wire rack to cool completely. They look great. I was trying one the other day but didn't like the dough all that much, I notice orange juice and zest in your recipe, something to try.